Super Engineer II watch bracelet is designed for Seiko Scuba Diver SKX007, SKX009 and SKX011 models or other 22mm lug Seiko diver or sport watch case with the same curvature as the above models. Super Engineer II is composed by 5 chamfer edge well-made solid 316L stainless steel units. Screw-in adjustable details instead of pressure pins. This item includes one pair of FAT spring bar (eg. generic Seiko Dia. 2.5mm spring bar) to ensure a more secure connection. Accompanied with newly modified Button Chamfer diver's clasp with push button addon, made from solid 316L stainless steel with extra 6 micro holes for flexible fine tune length adjustment. 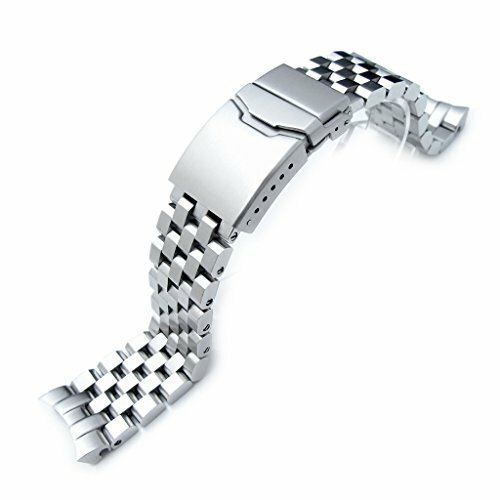 Button Chamfer double locks diver's buckle is ideal for watch band with thickness approximate 4.0 - 5.0mm. This unique aftermarket watch bracelet tailor made for Seiko SKX007, SKX009 and SKX011. If you have any questions about this product by Seiko Replacement by MiLTAT, contact us by completing and submitting the form below. If you are looking for a specif part number, please include it with your message.